The last day of Klunker before the Winter break! 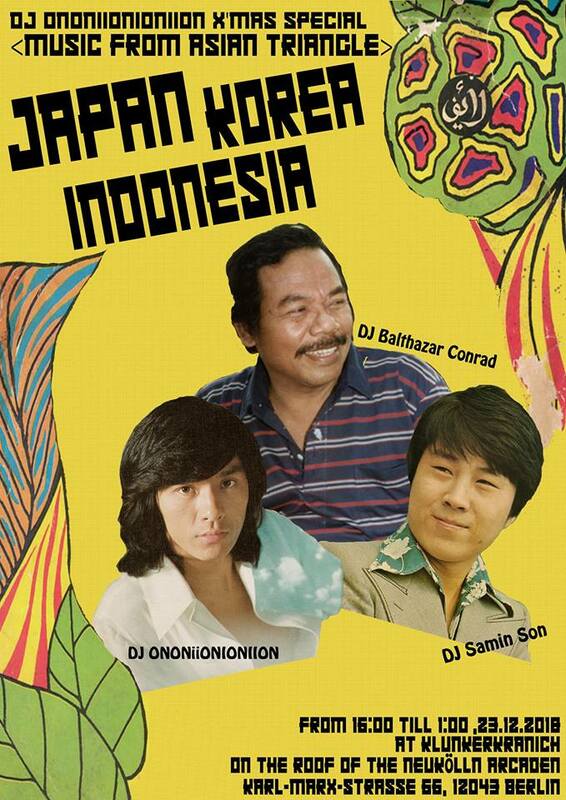 Asian santa will bring pop music from the Asian triangle, Japan-Korea-Indonesia! !I Invited an Berlin based artist Samin Son and Indonesian-German princess Balthazar Conrad is back!! aka Taishi Nagasaka, is a Berlin based classic J-Pop DJ/musician/Event organiser,who has been through world music, experimental music etc.He is currently playing as Jaguar No Me, Cozmik Onion Express, Camera, Iwazu Mo Gana. He was a bass player of Fat White Family, and has shared stage with John Cale, Iggor Cavalera, Bo Ningen, Flamingods, Group A, Camera, Sclupture, Hibiki Ichikawa as different projects.